Translating needs … into products. Creativity, energy and innovation are powerful drivers to building and managing growth. Our Horizons Growth Program provides the framework and process for doing just that, with impressive results – like bringing our new Avery® Sign Kit to market in record time. This revolutionary do-it-yourself product gives consumers the ability to get a sign-shop look from their desktop printers. 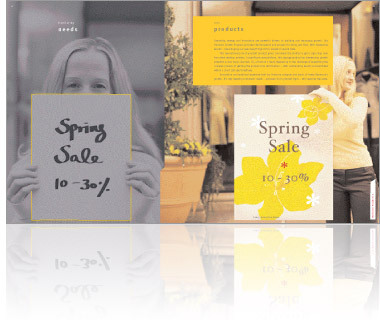 A significant new platform, this signage product has tremendous growth potential across many channels. So, a Horizon 1 team stepped up to the challenge of expediting the complex process of getting the product into distribution – with outstanding results accomplished within a short 100-day timeframe. Innovation and technical expertise fuel our Horizons program and much of Avery Dennison’s growth. It’s why meeting consumers’ needs – and even do-it-yourself signs – will never be the same. Translating dreams … into possibilities. Not all innovations can be created and launched in 100 days. Our Horizon 2 program is for products that need a little more development time: on the order of 18 to 24 months. Consider our Avloy® product, a dry paint film application that is used on a wide variety of automobiles, including the running boards of Chevrolet’s new SSR Sport Utility Vehicle. 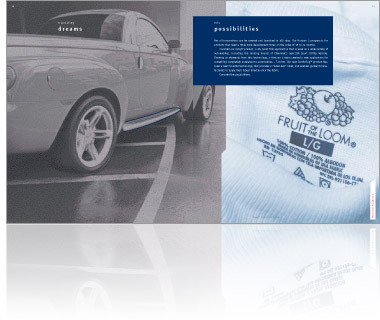 Drawing on elements from this technology, a Horizon 2 team created a new application for something completely unrelated to automobiles – T-shirts. Our new ComforTag™ product features a heat transfer technology that provides a “label-less” label, and enables garment manufacturers to apply their labels directly onto the fabric. Translating technology … into opportunity. A label requires more than just glue. The beer industry previously relied on traditional, glue-based paper labels for its bottles. However, as beverage manufacturers expand the requirements and stringent performance standards for label functionality, pressure-sensitive adhesive material has surfaced as the preferred choice. 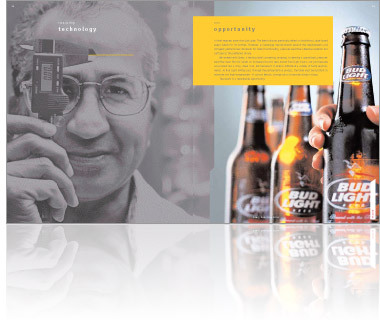 We worked with Spear, a leading label converting company, to develop a specialized, pressure-sensitive clear film for labels on Anheuser Busch’s well-known Bud Light brand, not just because our product has a crisp, clean look, but because it is able to withstand a variety of harsh environments. As Bud Light bottles pass through the pasteurization process, the label must be resistant to moisture and high temperature – it cannot detach, change color or become cloudy or hazy. The result is a remarkable opportunity.